Isabelle d'Aragon, daughter-in-law of Saint-Louis, wife of Philip III (the Bold). Died prematurely in 1271. Isabelle died while crossing a ford during her return journey from a crusade, while she was pregnant. 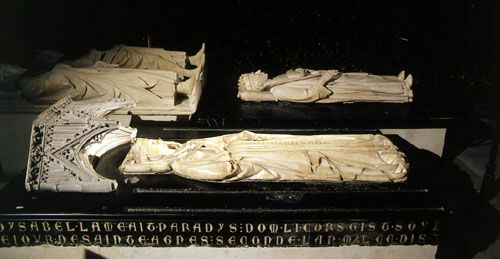 This tomb from the late 13th century was the beginning of a style which was to last throughout the 14th century. 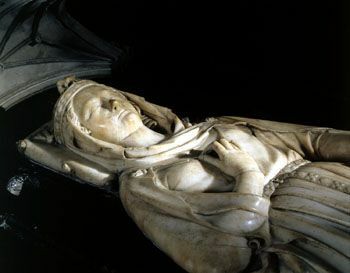 Her tomb is realistic in its depiction of the flowing folds of her clothing. The white marble, formerly highlighted in different colours, is on a black marble plinth on which is carved a rhyming epitaph in French. The monument is the only one that was left intact during the Revolution, thanks to its fine non-religious inscription.